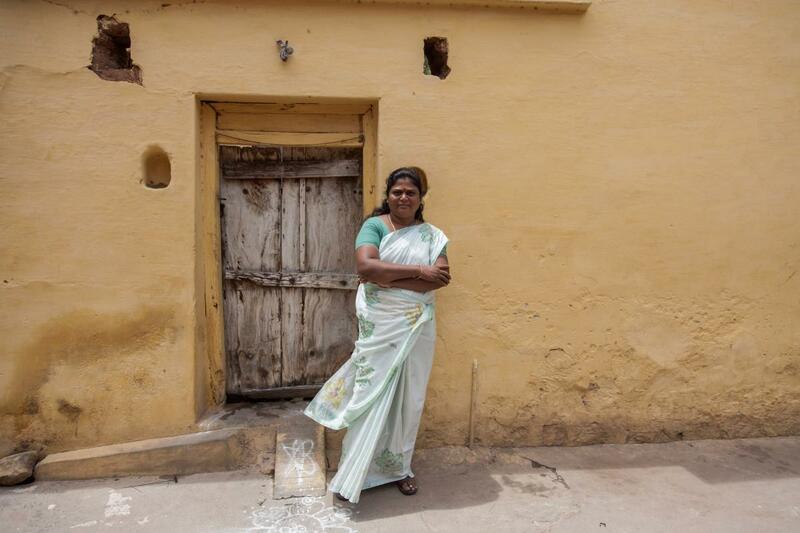 Like the majority of rural Indian women, Arunachalam Muruganantham’s wife could not afford to buy sanitary napkins. Her husband’s attempt to make them at home grew into a quest that would consume more than six years of his life, bringing him into conflict with his culture, his community and his own family. Persistence, ingenuity and trial-and-error paid off in the end. Arunachalam Muruganantham, the son of a weaver in a small village in Tamil Nadu, is probably the first man ever to wear a sanitary napkin. When he discovered that his wife Shanti had been using rags instead of sanitary pads during her menses so that she could save money to buy milk, he decided to buy her a box of pads as a gift. Little did he suspect that he was setting off on a complicated and arduous journey. On the way, he would sell everything he owned, be rejected and abandoned by his wife and mother, and face exile from his village. In the end, however, he would also revolutionise the sanitary pad market in India, making improved feminine hygiene a reality for countless rural women and even giving some of them a chance at financial independence. According to a 2010 survey conducted by AC Nielsen and NGO Plan India, only 12% of the 355 million menstruating women in India use sanitary napkins. Usage is even lower, around 5%, among rural women, who use tree leaves, sawdust, newspaper, ashes and even sand, leading to increases in urinary tract infections, pregnancy-related complications, congenital infections and cervical cancer. During menstruation women are traditionally forbidden to enter kitchens and temples, and menstruation is also part of the reason that 23% of India’s girls drop out of school upon reaching adolescence. Taboos concerning menstruation are so strong that women hardly speak of it even among themselves, much less with men. A 2012 survey by the Water Supply & Sanitation Collaborative Council found that 90% of Indian girls are caught unprepared for their first menses, never having been told about it even by their mothers. Just 12% of all menstruating women in India use sanitary napkins, a statistic that is the result of deep-rooted social and economic factors. Menstruation taboos impact not only on women’s health, but also on their opportunities for education and employment. This is the cultural environment in which Muruganantham unwrapped a sanitary pad one day, curious to see what it was made of. Finding an absorbent pad wrapped in cloth, he decided to try to make one himself using materials from the local textile mills: cotton and the non-woven interfacing used to stiffen shirt collars and cuffs. He gave it to Shanti to try. She didn’t like it. She went back to her rags. Undaunted, Muruganantham continued to experiment with cotton from Mumbai and even Switzerland, searching for the right materials, the right construction. But product testing, which could only be carried out a few days per month, was frustratingly slow. He recruited his sisters to help with the project, but perhaps because of the social stigma, their feedback lacked detail and was of limited value. One of his acquaintances had a daughter who was studying medicine, which inspired him to ask medical students to participate in his project. Even these future doctors, however, were hesitant to discuss menstrual issues with a stranger. He tried using a written questionnaire so that they could provide feedback without the awkwardness of face-to-face interaction, but soon discovered that although the women were sympathetic to his cause and his efforts, so many of them were uncomfortable with the topic that a few women were filling out the questionnaire for all the others, rendering the data unusable. At this point Muruganantham came to a momentous decision: he would try the sanitary pads himself. He took the inside of an old football, filled it with animal blood and wore it throughout the day to see how effectively his pads absorbed the blood. Although he developed a new respect for the discomfort women endure every month, this new development upset his wife so much that she filed for divorce and fled to her parents’ home, convinced that his research was only a pretext to get close to the medical school girls. One day Muruganantham saw a stray dog pulling a used sanitary pad out of the community rubbish bin. Suddenly he realised that he could collect used pads and perform his own analyses instead of relying on potentially falsified questionnaires. Returning to the medical school, he gave the students a bin where they could dispose of the napkins. Encouraged by the anonymity of the process, the women agreed. Muruganantham, however, secretly colour-coded the pads, which enabled him to sort the data by participant. Still, the procedure was not easy. He would collect the napkins and spread them on a table to dry overnight, giving the odour time to dissipate. In the morning he would inspect them, comparing his products to the commercially manufactured ones. Unfortunately, Muruganantham’s mother found the objects of his research spread out on the table. Although she had stayed by his side when his wife left him, now she too moved out, convinced that he had gone mad. Other villagers believed that he had been possessed by an evil spirit. The village elders gave him a choice: either he would be tied to the holy tree of the village for a week so that it could absorb his bad energy, or else he would be banished. Muruganantham decided to move out, finding lodging with five other people in a small room. At this point, he had been working on his sanitary pad project for nearly two and a half years. It would be another four and a half years before he finally succeeded. Muruganantham had to develop not only an effective product, but also the process that would make his product possible, and the business model that would make it accessible. All this took place in the context of a culture that suppressed the mere mention of the problem the product was designed to solve, and in a market controlled by multi-national corporations. The problem, as he had realised, was that his pads contained cotton, whereas the name-brand pads used pine cellulose, a material far more absorbent as well as far more expensive to manufacture. 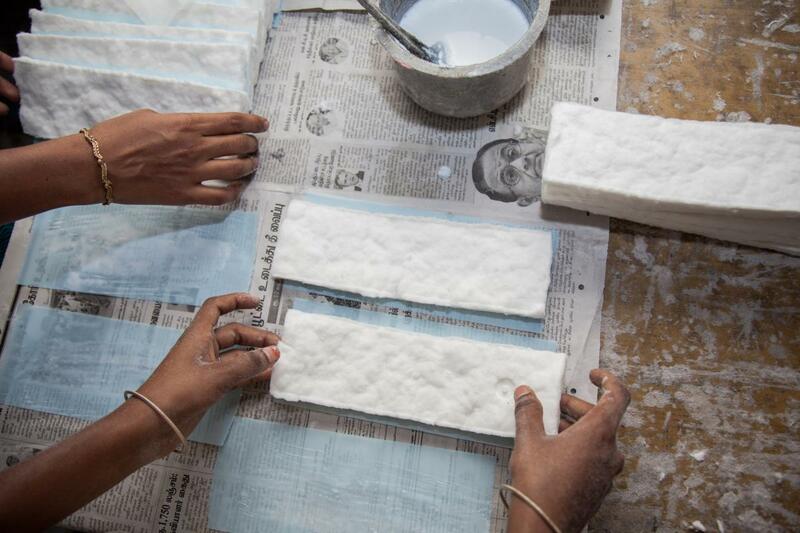 International corporations like Procter & Gamble or Johnson & Johnson could afford multimillion-dollar plants to manufacture their cellulose padding, but Muruganantham needed to be able to produce an effective absorbent at an affordable price. Years of experimentation finally yielded a high-quality cotton product, but that was only the first part of his project. The original idea, after all, was not only to develop an effective sanitary pad, but to make it accessible to women like Shanti, women living in rural areas where lower incomes and powerful taboos prevailed. He remembered his mother, a farm worker and a single woman who had raised him and his sisters on her own. He understood that his invention could make it possible for women to manufacture and distribute sanitary napkins themselves, a business model with enormous potential, since women would be far more comfortable hearing about and buying sanitary pads from other women. Muruganantham revels in the fact that companies like Procter & Gamble cannot barter their pads for potatoes. Sumathi, a resident of Namakkal, was working in a library when she saw an advertisement for Muruganantham’s machine. She took out a bank loan for ₹400,000 (around €4,800 or US$6,500) to start her business in an abandoned house. Now, two years later, she and her full-time staff of seven women can produce about 500 of her Breeze Napkins on an average day (when the electricity works for about five hours), nearly twice that number if the electricity works all day. Including overheads, each pad costs ₹1.0–1.5 (around €0.01) to manufacture and can be sold for ₹1.5–2.0 (around €0.02), a considerable profit even at prices markedly lower than those of the name-brand competition. 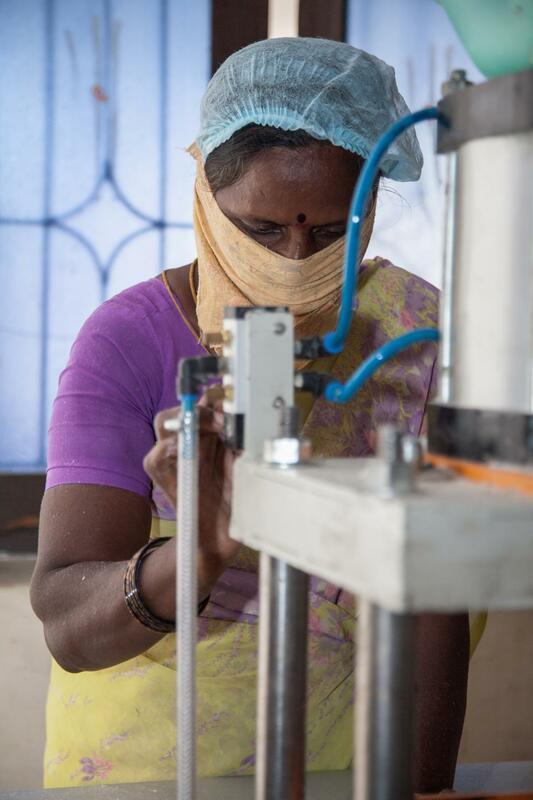 Sumathi says that running her own business has increased her self-confidence and that it gives her great satisfaction to be able to offer steady work to her employees and a useful, high-quality product to other women. The pricing strategy is as superbly adapted to local conditions as the production and distribution model. 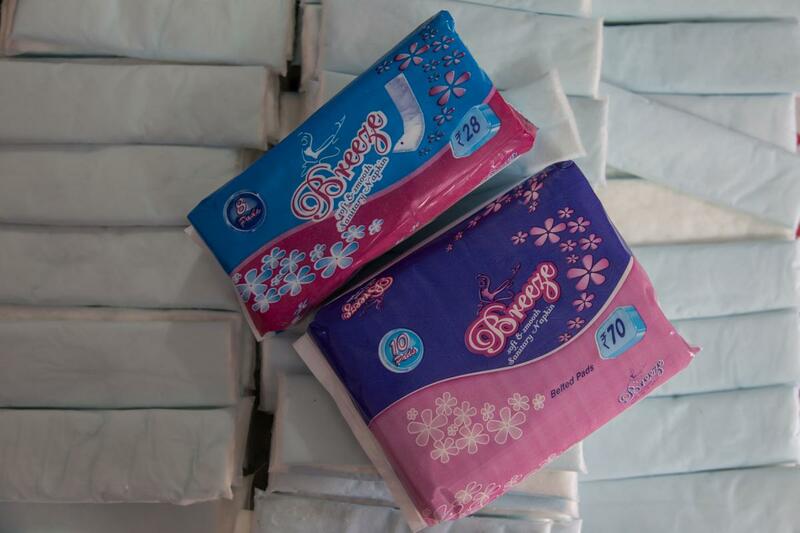 Unlike name-brand sanitary pads, which generally have to be bought in packages of at least eight, Breeze Napkins can be purchased individually. They can also be paid for in instalments or bartered for vegetables, giving entrepreneurs like Sumathi a tremendous advantage over the multinationals in rural markets. Sumathi reports that a lot of women are manufacturing pads in every district of Tamil Nadu, and Muruganantham himself states that he has provided over 700 machines to women in more than 23 villages. His vision has expanded to include creating one million jobs for rural Indian women, as well as breaking into similar markets in Bangladesh, Nepal and Africa. Shagun Singh is a New York-based activist and writer who examines alternate trajectories of growth and development beyond those accepted in the developed world, especially in her native India. Harsha Vadlamani is an Indian documentary photographer who travelled to Tamil Nadu to photograph women entrepreneurs for WTW.